Natural gas customers in two western counties have been urged to turn off their supplies after odourless gas was pumped into the system from the Corrib gas refinery. Gas Networks Ireland has advised customers in Galway and Mayo to switch off supplies at the gas meter box until further notice. It is understood 9,600 domestic and commercial customers may have received the odourless gas, including hospitals. In north Mayo, Shell E&P Ireland is attempting to burn off the existing gas within the system by “flaring”, and the Environmental Protection Agency (EPA) has sent inspectors to the refinery. Natural gas is odourless, colourless and tasteless, and a chemical containing sulphur is normally added to give it a scent for safety reasons. Gas Networks Ireland says that Galway city, the towns of Tuam and Headford in Co Galway and Ballinrobe, Castlebar, Claremorris, Westport, Crossmolina and Ballina in Co Mayo are affected by the alert. In a statement, the company says it is recommending supplies be switched off as “in the unlikely event of a leak, customers in these locations only will be unable to smell gas in the current circumstances”. “We will work with priority customers including hospitals to try to ensure their operations are not interrupted,” it said. Gas Networks Ireland said it apologised to customers for any inconvenience caused by these measures. “While the risk is low, safety is our first priority in operating the network,” it said. Shell E&P Ireland has been burning off gas within the system at the Corrib gas refinery since early Thursday morning, with flaring expected overnight and well into Friday. Residents in and around the area have been notified of “increased noise levels” and “visual impact” from the flaring, which began at around 7.30am on Thursday. The EPA said in a statement that it had been “notified” of a “flaring event” at the Shell E&P Ireland gas terminal, which started on Thursday morning as a result of “issues with the quality of gas exported from the terminal”. It said the flaring was expected to continue for a “further 12 to 24 hours”, and its inspectors were “attending the site”. Flaring or burning off of flammable gas is activated if there is a pressure rise in the plant, or a fire or gas release. Under the project’s integrated pollution prevention and control (IPPC) license, awarded by the EPA, flaring can only be used “for safety reasons or for non-routine operational conditions” due to its negative impact as the practice contributes to greenhouse gas emissions. 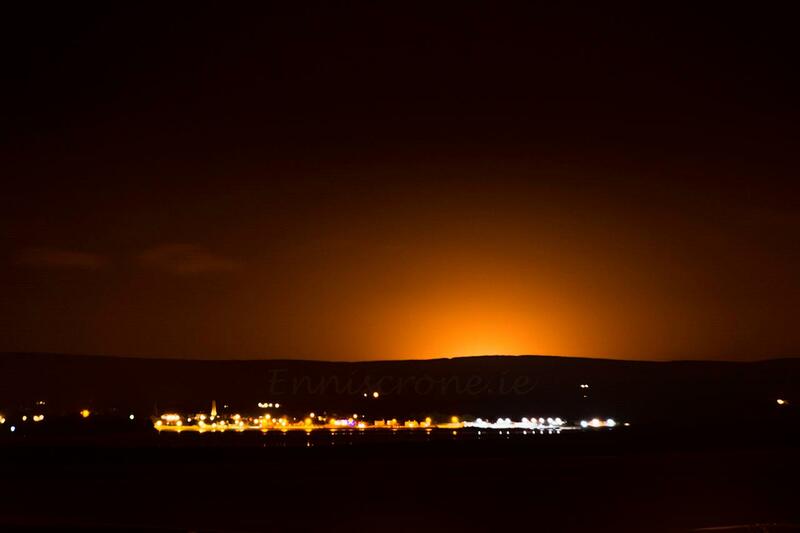 A text alert sent by the refinery operators to residents in the Ballinaboy area said that the flaring was the result of a “technical issue relating to the addition of odourant to the gas stream”. Local activist Mary Corduff said that residents had been informed in advance of previous flaring on September 11th, and there was a distinct smell of gas in the vicinity of the refinery for three days from September 11th to 14th. She said she had notified the EPA. In September 2016, Shell was fined €1,000 and ordered to pay €15,000 in legal costs for causing light and noise pollution from a gas flare during start-up testing on December 31st, 2015 at the Corrib refinery. The company pleaded guilty at Dublin District Court in September 2016 to breaching two parts of its EPA industrial emissions licence in 2015. Shell acknowledged that the 2015 flaring was “exceptional”, and promised to “take all measures” to minimise further occurrences. Last July, Shell said it was selling its stake in the project to the Canada Pension Plan Investment Board, with the sale expected to be completed by June 2018. In a statement Thursday night, Shell E&P Ireland said it could “confirm that a quantity of odourless gas has entered the Gas Networks Ireland (GNI) network”. It said it expected flaring to continue through the night. Gas Networks Ireland says that customers seeking assistance can visit its website www.gasnetworks.ie or call its customer care line on 1850 200 694. It says customers who suspect a gas leak or smell gas should always call its 24-hour emergency line on 1850 20 50 50.